Get a funny picture or movie sent to your iPhone or iPad that you want to send along and share with someone else? Messages app allows you to easily create new image and media messages directly from an existing message thread, without having to use the traditional forward feature. This makes sharing images, funny videos, amusing gifs, and anything else from a message thread image list easier and faster than ever. You can either send them to another contact directly, or post them to your Facebook and Twitter feeds if you’d prefer to share them more broadly too. Only the image, media, or video gets sent using this trick, because it’s actually just creating a new message from the image rather than using the traditional text forwarding feature, which includes the text by default. In this case, no text will be attached, and none of the original senders contact information will be sent along either. If you choose to post to Facebook, or send the media as a Tweet, the same situation applies and you will only post the image or video, not any accompanying text. 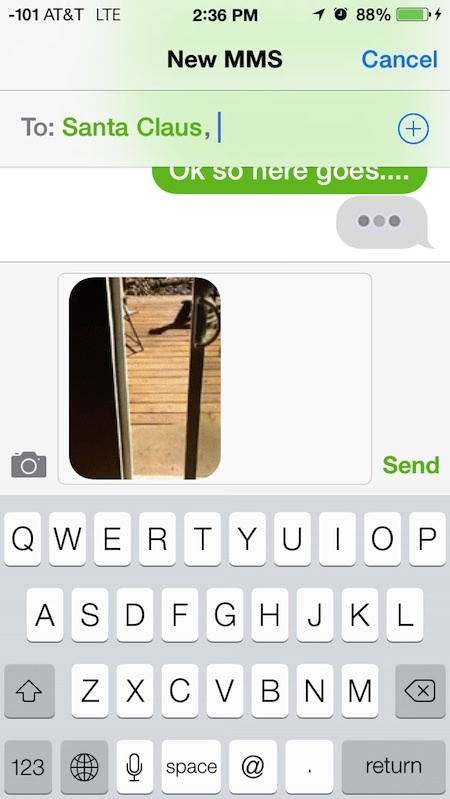 The ability to create a new message right from an in-line picture really is the fastest way to share media files from an iMessage chat in iOS, whether it’s a video or a photo, or even a sound file. 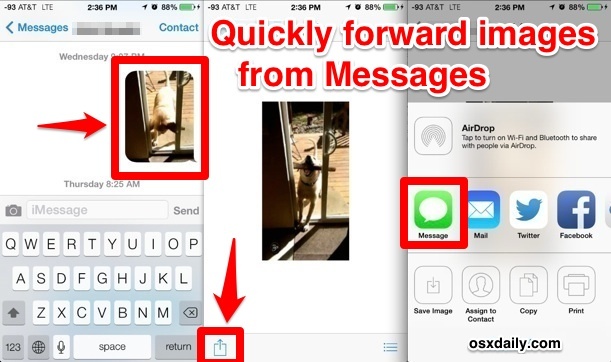 Prior to the Messages app changes with iOS 7.0, users either had to use copy and paste – which continues to work but is a bit slower – or save the picture to the Photos app Camera Roll and start over from there, a bit more cumbersome and certainly slower.